A wildfire in Yarnell, Ariz., in June killed 19 firefighters and destroyed scores of homes. Heartbroken homeowners and the families of those killed in June’s deadly Arizona wildfire are joining forces six months later — filing a spate of lawsuits collectively seeking hundreds of millions of dollars in damages from government and fire officials. They claim “negligence, carelessness and intentional misconduct” contributed to their losses as the Yarnell Hill fire ravaged more than 8,000 acres and 100 structures over nearly two weeks. Nineteen elite firefighters with the Granite Mountain Hotshots perished when shifting winds trapped them within a wall of flames. One of the latest claims, filed last week by Nina and Chuck Overmyer, is on behalf of all residents and property owners in Yarnell and surrounding communities affected in Yavapai County, about 100 miles north of Phoenix. The Overmyers are personally claiming $865,000 in property losses, lost income and other fire-related expenses. “With reasonable professional planning and coordination of available firefighting resources, the firefighting managers could have prevented Yarnell’s obliteration without endangering the surrounding communities and the Granite Mountain Hotshots and other firefighters battling the Yarnell Hill fire,” the claim says. The Overmyers’ attorney didn’t immediately return a call to NBC News seeking comment. At least 50 other property-owner claims have been filed totaling more than $184 million in damages,reported The Daily Courier in Prescott. That’s in addition to fourteen families who’ve filed wrongful-death claims seeking more than $300 million. The plaintiffs have named the city of Prescott, the state of Arizona, Yavapai County and the Yarnell Fire District among the defendants. Nick Cornelius, an attorney for the Central Yavapai Fire District, said Tuesday that there’s “no basis for a claim” against the district, and declined to comment further because the claims are pending. The city of Prescott has previously said it is not liable and denied other claims, The Associated Press reported. 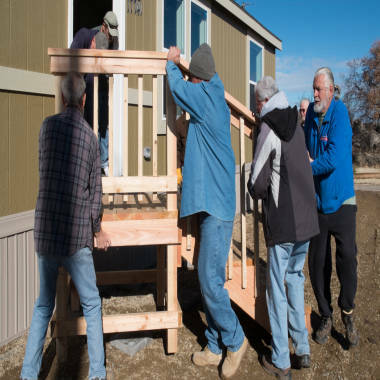 Volunteers put the finishing touches on a new home built Dec. 20, 2013, in Yarnell, Ariz. The mounting suits, meanwhile, are having an unintended consequence: Arizona lawmakers have halted plans to financially help the families of the Hotshots killed in the fire. A bill that would have been introduced in next year’s legislative session — providing benefits retroactively to the firefighters, most who served seasonally — is now on hold as the claims need to be settled,according to The Arizona Republic. “The families will not be making any public statement during this holiday season and request that their privacy be respected by the media during this difficult time,” Kelly said in a statement. The firefighters’ families have the leverage of a bombshell report commissioned by the Arizona Division of Occupational Safety and Health, which found the Hotshots were essentially doomed from the start. 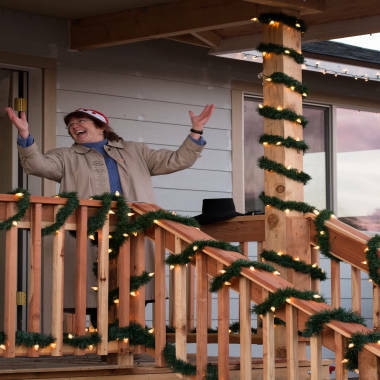 Frances Lechner, of theYarnell Hill Recovery Group, shows off a new home completed Dec. 20, 2013, after the fire in Yarnell, Ariz. There was a lack of key personnel amid the chaos, poor communication and the firefighters should have been extracted from the scene before a known thunderstorm and its winds whipped flames perilously close, according to the findings. All but one of the Hotshots on duty were killed — the survivor was serving as a lookout at the time. The Arizona Industrial Commission, which oversees workplace safety, cited state forestry officials and levied a $559,000 fine based on the report. The Arizona State Forestry Division said last week it is requesting a hearing to contest the citation. An earlier report in September — commissioned by state forestry officials — gave a far different account, finding that there was no negligence or violations of protocol during the response, although radio communication was an issue. The lawsuits, meanwhile, aren’t the only concerns consuming residents of Yarnell and surrounding communities. Since the fire, there’s been a flurry of activity to rebuild. Volunteers with the Yarnell Hill Recovery Group have helped to construct 22 homes with another 33 in the works, said spokeswoman Frances Lechner. A total of $400,000 in donations and aid to the group has been dedicated to those homeowners who are uninsured, while up to $10,000 was set aside for each family who is under-insured. Faith-based groups, including the Apostolic Christian World Relief, Mennonite Disaster Services and the Southern Baptist Disaster Relief, traveled to Yarnell to provide free labor. On Friday, Lechner and the volunteers held a “house lighting” ceremony for one couple who lost their home in the fire and were anxious to have a permanent place in time for Christmas. Lechner, who was lucky not to lose her home, said that in a community of 650 people, even one person’s pain is widely felt. PHOENIX — Arizona forestry officials put the protection of structures and pastureland ahead of firefighter safety during a raging wildfire that killed 19 members of an elite firefighting crew in June, a state health and safety investigation said on Wednesday. 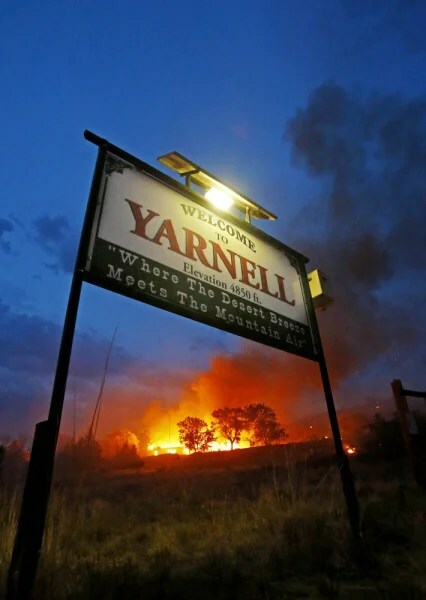 Arizona’s Division of Occupational Safety and Health also found that the Arizona State Forestry Division committed other workplace safety violations in its management of the blaze in and around the tiny town of Yarnell, northwest of Phoenix. The Granite Mountain Hotshots firefighting team was engulfed by wind-whipped flames on the third day of the lightning-sparked blaze that destroyed scores of homes and charred 8,400 acres. One crew member survived. “When the employer knew that suppression of extremely active chaparral fuels was ineffective and that wind would push active fire towards non-defensible structures, firefighters working downwind were not promptly removed from exposure to smoke inhalation, burns, and death,” according to the report presented to the Arizona Industrial Commission. The division proposed penalties of $559,000, and the Arizona Industrial Commission voted unanimously to approve them on Wednesday. The state forestry division said in a statement it had cooperated with the investigation but could not comment further because it had not yet reviewed the report. The fire marked the greatest loss of life from a U.S. wildfire since 1933, when more than two dozen firefighters were killed battling the Griffith Park fire in Los Angeles. The investigation went on to cite fire managers for failing to carry out “incident complexity analysis” after the blaze escaped the team’s initial attack, and entered an “extremely dangerous” transition to an extended attack on the fire. The findings differ from conclusions drawn by a multi-agency report that was released in September, which found no evidence of negligence or reckless behavior in the firefighters’ deaths. At that time CBS News spoke to Julia Ashcraft, whose husband Andrew was killed. That report, which left many questions about the blaze unanswered, led to the filing of a notice of claim last month on behalf of Marcia McKee, whose 21-year-old son, Grant Quinn McKee, was among the firefighters who died in the fire.